Fifty years ago on August 28 1963, Dr. Martin Luther King delivered his famous speech at the foot of the Lincoln Memorial in Washington. A pastor and the figurehead of the civil rights movement in the US, King used the Bible and the US Declaration of Independence to help shape those iconic words. “I have a dream that one day this nation will rise up and live out the true meaning of its creed: ‘We hold these truths to be self-evident, that all men are created equal,” said King in the most memorable part of the speech. The US abolished slavery in 1865 after the Civil War. However, the fact remained that in many states black people were still treated as second-class citizens. Founded in the same year as slavery was abolished, the Ku Klux Klan created a climate of terror for black people. In addition, there was racial segregation in the south. John W Franklin, with the Smithsonian’s National Museum of African-American History & Culture described the segregation in the US capital. “Right here in Washington there were no restaurants in this part of town where I could have gone or my parents could have gone to eat. None of the hotels in this part of town would have accepted African-Americans as guests. None of the hospitals would have accepted African-Americans as patients. There was a small section of black (Washington) DC where there were banks and stores and only in those stores could African Americans try on clothes,” said Franklin. Resistance to segregation was mainly organised by Baptist churches. Martin Luther King was the head of the congregation at Dexter Avenue Baptist Church in Montgomery, Alabama. A black woman being arrested in Montgomery for not giving up her seat on the bus for a white passenger, led to a campaign by black people refusing to use the city’s bus service. That woman was Rosa Parks and Martin Luther King helped organise the 1955 Montgomery Bus Boycott. King encouraged nonviolent protests such as sit-ins, marches and boycotts of companies that discrimated against black people. The civil rights leader was jailed during the 1963 campaign in Birmingham, Alabama, where desegregation was being strongly resisted by many white people. 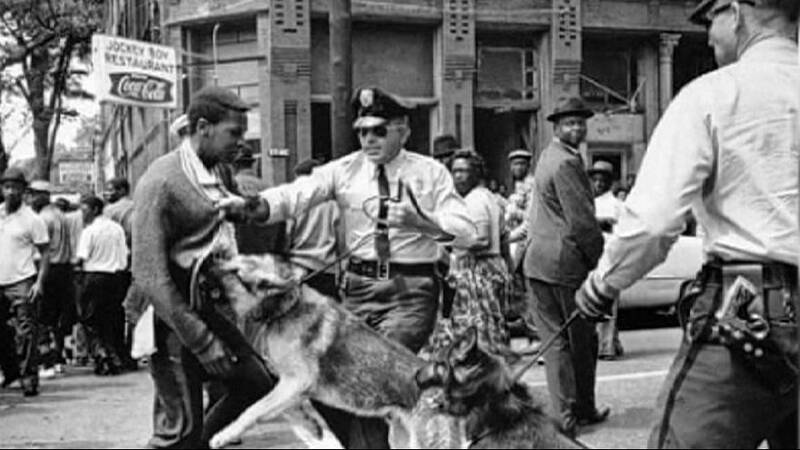 “In May of that year – in Birmingham, Alabama – there had been a children’s campaign where elementary and high school students left class to go demonstrate in the streets,” recalled Franklin. “This is also the dawn of television, not only in the United States but across the world, and the images that Americans saw, black white, Latino, Asian, and how these children were attacked by fire hoses, adults were attacked by these police dogs, really seared the nation’s conscience,” he explained. The famous speech, which became a high point for the civil rights movement, came during what was official known as the ‘March on Washington For Jobs and Freedom’. President John F. Kennedy, who had spoken out in favour of civil rights, was assassinated three months later. President Lyndon B. Johnson signed the 1964 Civil Rights Act and the 1965 Voting Rights Act. The US federal government now had the power to end segregation in the southern states and it became easier for black people to vote. King was shot dead on the balcony of the Lorraine Hotel in Memphis, Tennessee on April 3, 1968. Johnson announced a national day of mourning three days later on April 7. A week of race riots in several US cities after King’s death was contrary to the nonviolence he had advocated while he was alive, but many black people felt there was still a long way to go. Many still do, according to Franklin. “So the struggle is an ongoing struggle. Many people now are able to register and to vote. We have elected a man of colour as President of the United States of America. Some people today ask me whether the election of President Barack Obama is a fulfillment of Dr King’s dream. I say ‘no, it’s just a down payment.’ We’re not there yet. Still too many people that have been left out and left behind,” he concluded.